The Sea Marconi Laboratory is a leader in the diagnosis of degradation of insulating fluids and electrical equipment, such as power and instrument transformers, reactors, rectifiers, drives and feedthroughs. Every year, the Laboratory performs more than 9,000 diagnoses, oriented towards Condition Based Maintenance (CBM) and the prevention of failures in transformers, for a total of more than 87,000 measurements carried out. All measures dedicated to the diagnostics of fluid degradation, interception of faults and estimation of the ageing of assets are performed in-house, using cutting-edge instrumentation and techniques. The diagnostic experience of the Sea Marconi Laboratory is based on thorough knowledge of the areas of generation, transmission, distribution and use (especially in large industry) of electricity. Advanced specialisation in diagnosis results in interpretive and analytical capacity for all insulating fluids including mineral oils, silicones, askarels, synthetic fluids (ester base nd aromatic base), and mixed and special liquids. The laboratory uses more than 10 different proprietary diagnostic and interpretative algorithms (based on families of appliances) for translating analytical results into valuable information for the customer. Each diagnosis reveals the conditions of degradation, evidence of anomalies or faults, corrective and preventive actions proposed to the customer and the relevant priorities for action. the Sea Marconi Laboratory has always considered quality of service as part of daily operations. Over the years, this has resulted in major certification (ISO 9001) and accreditation (ISO/IEC 17025, Accredia accreditation No. 0899). 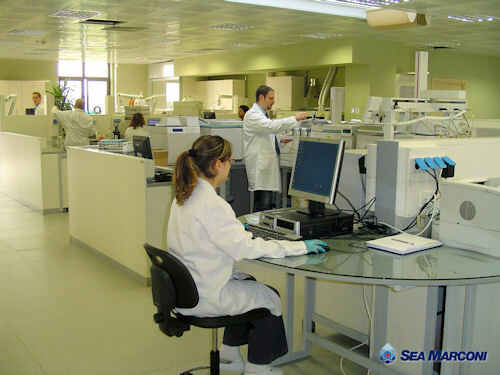 In November 2012, during an audit that placed not only the analytical laboratory but also the entire company under scrutiny, Sea Marconi extended the accreditation to cover another three tests. Accreditation is a guarantee of quality of the laboratory, which is subject to continuous verification of analytical performance and the procedures that govern it. 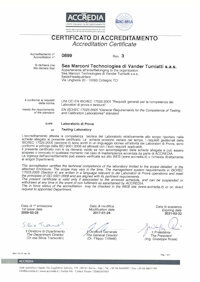 Thanks to all the accredited tests (see below), the Sea Marconi laboratory is one of the very few laboratories in the world (the only one in Italy) able to offer a packet of accredited tests that are fundamental for the diagnosis of electrical equipment with insulating fluids. ACCREDIA’s involvement in multilateral mutual recognition agreements (MLAs) means that Sea Marconi test reports are recognised and accepted internationally by all signatory nations of mutual recognition agreements [see list of European Accreditation (EA) countries and list of International Accreditation Forum (IAF) countries].